Beautiful home with large windows gives a sweeping view from every level of this home of our beautiful Wallowa Mountains. A custom built home with beautiful views thru those awesome windows Drone footage taken from Arapahoe Lodge. A steeper driveway but worth the climb Stairs that you will climb to access the main floor/living area of the Arapahoe Lodge. The living room offers a fireplace and beautiful windows to enjoy nature. A birds eye veiw from the loft into the kitchen, dining, and living room of the Arapahoe Lodge. A queen sized bed, fireplace, and a door that opens to the outside Only thing that makes that better would be a beautiful bathroom. Oh, CHECK Got that too The beautiful bathroom off of the master bedroom. Oversized, walk-in tile shower not shown. This is a beautiful custom built home located at the South end of Wallowa Lake. This home is a three story home and you will get to enjoy the middle and top level. The main level (up one flight of stairs immediately upon entering) has an awesome tree line view looking out the large picture windows. Deck with a view is easily accessible from the kitchen/dining area. 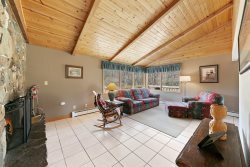 Living room has a propane stove, comfortable furniture and the floor plan is open between the gourmet kitchen, large dining room table into the living room keeping everyone together. The master bedroom is located on the middle level and has a door that opens to the hillside. Large jacuzzi tub, towel warmers, huge walk in tiled shower make this the favorite place to spend your evenings after a long hike or a day on the lake. Queen sized bed and a small flat screen TV in the bedroom with an electric stove at the foot of the bed. Climb a set of stairs into the loft where there are two twin beds and a queen bed (pull the panel curtains at night for added privacy). Large banisters in the evening can have the Pendleton blankets draped across them for additional privacy to the lower area. Private bathroom with a spacious clawfoot bathtub and lots of natural light. The perfect loft for a relaxing evening. The lower part of this home is Arapahoe Lodge Lower #38, which is also one of our homes. Combine it for additional sleeping. Each unit has it's own private entrance, and you just share the roof, but we do ask that you maintain a quiet time of 10 pm to 8 am to be respectful of each other's vacation. A very nicely furnished home! Bring your slippers because this is a strict NO SHOES home. Accessed off of main floor level, deck with patio furniture and bbq. * Parking for 2 cars. Sleeps 6. Upper area is open between queen bed and twin trundle, but does have panel curtains to draw for privacy. Upper area is viewed from main floor. For evening privacy, we suggest draping the Pendleton blanket across the panels for privacy. Occupancy and parking can not be exceeded due to this home having a vacation rental permit. Please see above under AMENITIES for parking and people allowances. No fires or fire pits are ever allowed due to the heavy timbered area and county restrictions. If you are looking for a place to gather with other members that are renting cabins, please use the Wallowa Lake State Park, Little Alps Day use Area, Joseph City park, north and south day use/boat launch areas. 1) Pilots: Tell us which Pilot Association Journal you found our ad in and receive 10% off your stay. 2) Midweek Specials: Offered anytime of the year. Any reservations arriving Monday and leaving on Thursday, and mention this special, and receive 10% off your stay. 3) Refer a customer and the next time you stay in #41 you will receive 10% off your stay, must stay 3 nights. 4) Refer 2 friends and the next time you stay in #41 you will receive 20% off your stay, must stay 3 nights. 5) If you combine #41 with your stay in #38, receive 10% off your total rental costs, must stay 3 nights. 6) Stay 7 nights or more and receive 10% off your stay. * Spices, oils, condiments, etc., are NOT included but some houses do have them. Wallowa Lake Vacation Rentals' staff sets the bar extremely high for all other rental companies. They treat you like family and your vacation experience is their #1 priority. There just simply is no one else like them! Wallowa Lake is our families' favorite place on earth. It is 'our' place to come to to escape the stress and busyness of every day life. This lovely cabin helped us do just that. From the moment we walked in, we were in cabin paradise! Loved every minute of it. The phone ladies were very helpful in helping us chose a home. Beautiful home, nice furnishings, great location. Loved it and will be back! Location - Resort side of Wallowa Lake. Properties located at the resort side of Wallowa Lake will be within easy walking distance of shops, activities, restaurants. The south side is more of the touristy side of Wallowa Lake. Enjoy the deer, be within quick walking distance to the Wallowa Lake Tramway, and be able to walk and enjoy the restaurants and shopping at Wallowa Lake easily from these south side homes.